It’s Greeley Grindhouse time once again! Mac Bell will show a killer turkey movie to celebrate the upcoming Thanksgiving day. 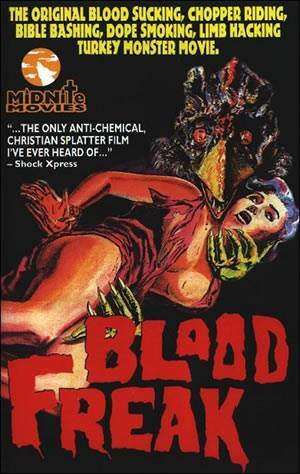 Join Greeley Avenue Bar & Grill on Tuesday, November 19th at 7:20 PM for a showing of Blood Freak. This movie was born in 1972 and follows Vietnam Veteran Herschell (Steve Hawkes). While taking a ride on his motorcycle he stops to help a young woman named Angel, played by Heather Hughes, who experienced car difficulties. Herschell takes Angel back to her home where he meets her sister, Anne, (played by Dana Cullivan), and several of her friends who are smoking weed. Although Herschell declines the weed, it isn’t long before he changes his mind, engages and immediately finds himself addicted. Herschell goes on to find a job at a local turkey farm where he meets two scientists who are experimenting by testing certain chemicals on turkey meat. Herschell agrees to participate in a test by eating some of the turkey meat; to convince him to agree, the scientists bribe him with more marijuana. After eating the entire turkey, he passes out and suffers a seizure. The two scientists eventually find him, and terrified of their experiments being discovered, they dump Herschell’s body in the woods. But Herschell isn’t dead. When he wakes up he discovers his head is now a giant turkey’s head instead of his own! And, instead of craving weed, he now craves the blood of other addicts! After finding Anne and asking for help, she agrees, but after Herschell kills three people to satisfy his habit, Anne finally goes to two friends to stop Herschell. Their plan? Beheading him with a machete. Will they succeed or will Herschell continue to reek havoc upon the community? Show up and find out! A bit of trivia: throughout the film, director Brad Grinter periodically appears to offer his commentary on the action. This entry was posted in Entertainment and tagged & grill, B movie, blood freak, free movie, Greeley Avenue Bar & Grill, Greeley Avenue Sports Bar & Grill, Greeley Grindhouse, Grindhouse by greeleyave. Bookmark the permalink.